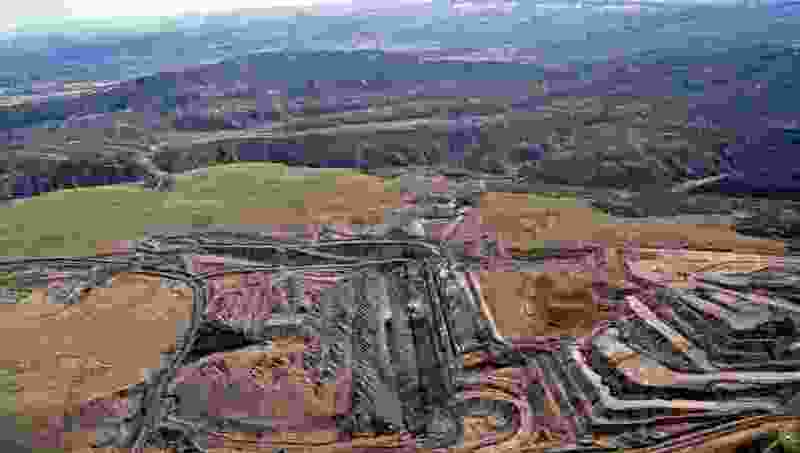 (Photo courtesy of EcoFlight) Utah's Coal Hollow strip mine near Alton hopes to tap federal coal near its current operations which are running out of coal to mine. Lawmakers are proposing to direct $2 million to the mine's lawyers to wage a legal assault on California's climate policies, which the say are imposing an unlawful "excise" tax on Utah coal and putting miners out of work. 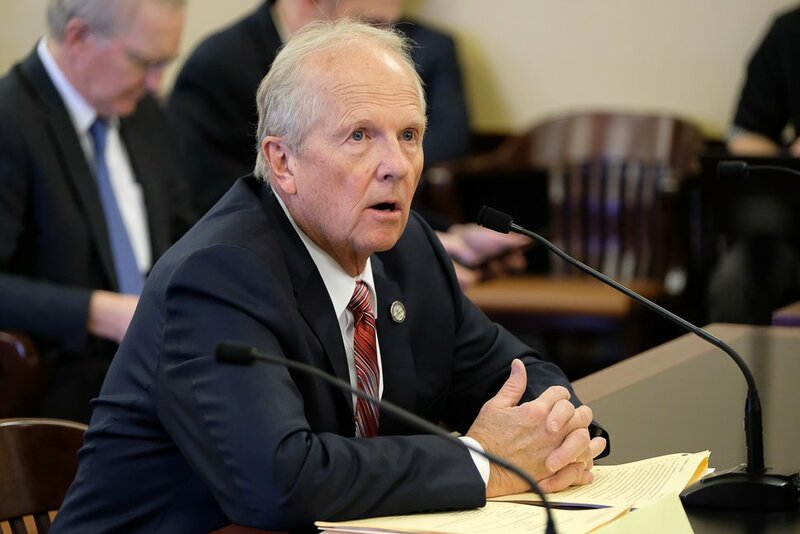 Utah lawmakers appear receptive to bankrolling a $2 million legal challenge against the state of California over its climate policies, which they claim unfairly penalize electricity produced with Utah coal. California’s laws aimed at curbing greenhouse-gas emissions make Utah’s coal a more expensive choice for generating power, industry advocates and legislators complain — and rural Utah is paying a huge price in terms of lost employment and royalties that could support the state’s schools. “It basically costs $28 more per ton of coal than other types of energy. That’s an impossible burden for the Utah coal industry,” said Denise Dragoo, attorney for mine operator Alton Coal Development, based in Cedar City. In hopes of reversing the trend, Rep. Mike Noel, R-Kanab, is seeking to funnel $2 million to lawyers at Dragoo’s law firm in Salt Lake City to mount a federal counter-attack in what Noel has called “California’s war on Utah coal,” on grounds its policies violate the U.S. Constitution. (Francisco Kjolseth | The Salt Lake Tribune) Rep. Mike Noel, R-Kanab, proposes HB136 to muzzle city and local officials from speaking out on public-lands protections during the House Natural Resources, Agriculture, and Environment Standing Committee at the Capitol on Tuesday, Feb. 6, 2018. Noel’s budget proposal has drawn initial support from members of the Legislature’s Natural Resources, Agriculture and Environment Appropriations Subcommittee. At Noel’s request, Dragoo’s firm Snell & Wilmer put together a spending plan budget for its private lawyers to litigate the case in Utah’s federal court. Dragoo said she would like to file the suit within two months, but it was not clear who the plaintiff would be. “It would be helpful to have the state of Utah involved as a plaintiff because of interstate commerce,” Dragoo said. Her proposed budget — which calls for spending $845,000 on expert witnesses and consultants, paid $650 an hour — covers court action only through a motion for summary judgment. A trial and any appeals would boost the cost substantially, but Noel isn’t worried. “I’m thinking we win the case and we get our money back,” he said. One California environmental policy expert, however, predicted the lawsuit Noel is pushing will accomplish little, aside from enriching industry lawyers at taxpayer expense. “My guess is Utah is throwing $2 million at something that has more bark than bite,” Jacobson said. While Noel derided California leaders for setting an example of how not to run a state, Jacobson contends the Golden State’s climate policies have helped spur a green-energy revolution that other states would be wise to embrace. “California has every right to pursue clean-energy policies… and to use its place in the market as the world’s 6th-largest economy to help move California and the rest of the world away from fossil fuels toward clean energy,” Jacobson said. He said he suspects the lawsuit seeks to set up “a race to the bottom,” where the dirtiest fuel sources get an advantage. Noel — whose Utah legislative district includes Alton and immense untapped coal deposits under land removed from the Grand Staircase-Escalante National Monument — has decried California’s emissions-reducing program as an “excise” tax that unfairly renders Utah coal uncompetitive, in violation of the Constitution’s Commerce Clause. In testimony earlier this week, Noel argued that California is imposing its values on other states, regardless of the cost to local economies that have invested heavily in fossil-fuel extraction. “There is a contract and we have filled that contract for years and years to supply power to the people in that area and all of the sudden their political philosophy changes, and they don’t want the power,” Noel told colleagues. Added Rep. Carl Albrecht, R-Richfield, “California’s law is way out of bounds,” because there is no way to distinguish between electrons generated by coal or other fuels. “For them to determine that there is a coal-fired electron is absurd to the maximum degree,” said Albrecht, a retired utility executive. Others argue that the impact of California’s system on Utah’s coal-reliant rural economies has been substantial. The Coal Hollow mine employed 50 miners when it began digging coal from an open pit near Alton in 2011, with most of its output going to Intermountain Power Project outside Delta to generate electricity bound for southern California. But IPPs purchases have since dropped off and are set to completely end by 2025, casting a pall of uncertainty over the mine which expects to land a fresh 30-million-ton federal lease this year, according to Larry Johnson, general manager for Alton Coal, which operates the mine. Though it is opposed by the Sierra Club and other environmental groups, the proposed lawsuit has earned letters of support from the Utah Mining Association; Bowie Resource Partners, Utah’s largest coal producer and a key supplier to IPP; Bronco Utah Operations, which runs a mine in Emery County; leaders in Kane County; and Barney Trucking, a dry-bulk hauling company in West Valley City. Officials with the Utah School and Institutional Trust Lands Administration, or SITLA, are also back the legal action. “Every one loves to tell you coal is dead. I can tell you coal is not dead,” said SITLA director David Ure, whose agency has acquired coal deposits in land exchanges with the federal government. In addition to seeking legal fees and an injunction against California’s “carbon tax,” the lawsuit would also challenge another California law banning the importation of coal-fired electrons after the expiration of existing contracts, according to documents marked “confidential” that were unintentionally posted online. North Dakota has successfully challenged a similar Minnesota law, according to Dragoo. Snell & Wilmer has assembled a legal team that includes the firm that won that case, as well as the lawyer who represented the California Chamber of Commerce in its efforts to block California’s rules. The Utah Attorney General’s Office would oversee the litigation, but all the work would be done by outside counsel and consultants. Sen. Jim Dabakis, D-Salt Lake City, said he was troubled that the firm recommending the suit would also get the lucrative contract to run the case. Other House committee members wanted coal companies to foot some of the bill. But for Noel, the state’s investment could pay huge dividends given the vastness of Utah’s coal deposits that could be generating royalties and jobs.